There are definitely ways in which someone can increase their chances of making a sale. It comes down to how bad you want to make the sale and what measures you are willing to go to in order to do so. Some people are different than others. To make a sale involving a bot, one must channel all attention to their particular product. When marketing this product, it is important to be honest in all dealings. As a tool to boost sales, messenger bots have some impressive metrics in their corner, including a 60% click through rate. Bot funnels are essentially similar to email funnels, just that they make use of messenger instead. Since almost all of one’s prospects are apt use Facebook messenger, using messenger bots is just logical. Even if your site is awesome and chock-a-block with great and relevant content that users are fascinated by and find useful, you may still be alienating a portion of those that land on your web pages. Why? Just because your content is ‘all that’ doesn’t tell the entire story. People landing upon your site are there for a specific purpose, everything they see should relate to that goal. It’s called personalization. And, while it’s great to have personalized content, if the ads and other promos etc. are about irrelevant subjects that have nothing to say or offer respective of the goals of those landing on the page than some landing and potential leads are going to get lost. So, along with the content, it’s important to personalize the shopping options. In fact, close to half of those surveyed said they would buy from retailers that personalized their shopping across the board. Business owners are realizing the need for this, as more than two-thirds believe that real-time personalization is where the money is. Conversion-specific design elements, like widgets can target landing users based on a number of important factors such as, location, devices the user has and past visits to the site. 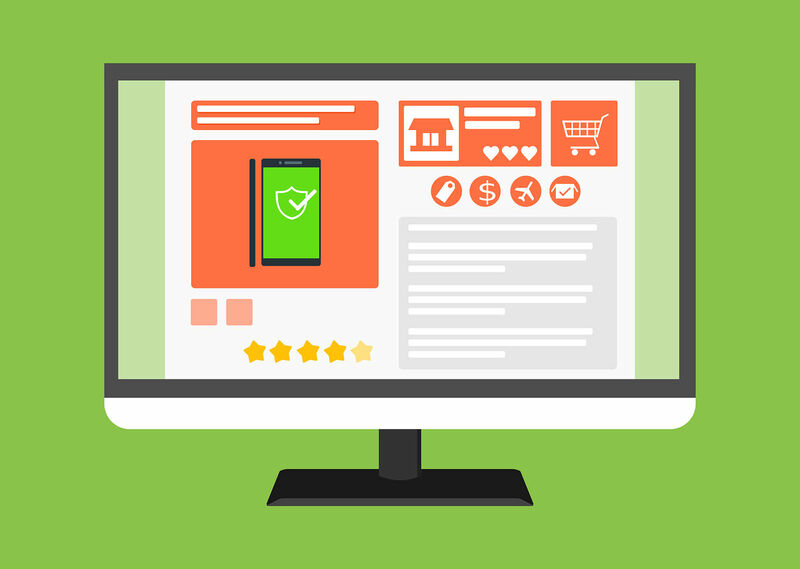 Using product recommendation engines, for example, allows gathering of users online behavior so that sites can generate ads specific to what they have shown interest in already. Retargeting campaigns that only go after those that have already shown interest in an offering is another great way to achieve conversion from interest to lead. The more site owners target the specific interest of each landing visitor the better their conversion rates will be. You can run special promotions for your client that are triggered according to the date, time, or the site visitor’s location. Use product recommendation engines that are based on algorithms that track your visitors’ online behavior. Keep in mind that your potential customers place a higher value on what interests them personally. Walmart recently acquired Flipkart. Oliver Rippel learned many things during his time as the company’s board director and recently divulged some secrets. Flipkart was the first company to offer more selections and categories through its marketplace, provide warehouse options, and employ their own delivery service. Although they were known for serving India mostly, they also thought globally with events like Big Billion Day. They employed robust and innovative industry leaders who knew the local scene well but could think big also. Flipkart was a massive success story for a short period of time before it faded away. If you catch people’s attention, you can definitely go viral rather quickly. There are many lessons that can be learned from things like Flipkart and how it got so successful. Google has offered an Undo Send feature to its users for a while now. This specific feature allows used to have, at least, 10 seconds to “undo” an emails sent on accident, etc. This feature has been present on Google’s Inbox app but for the Gmail mobile client, it has not been available. Now Android users will have this feature available in the new Gmail version 8.7. The Android Police warn users that the feature may not be present at first, but restarting the app should resolve the issue. Gmail’s 8.7 version for android is slated to incorporate Google’s undo send feature, which is already available to web users. The undo send feature didn’t become an officially listed Gmail feature until 2015. The Android Police, which ran the story about the 8.7 implementation of the feature, notes that may have to restart their Gmail even if they have an 8.7 version. 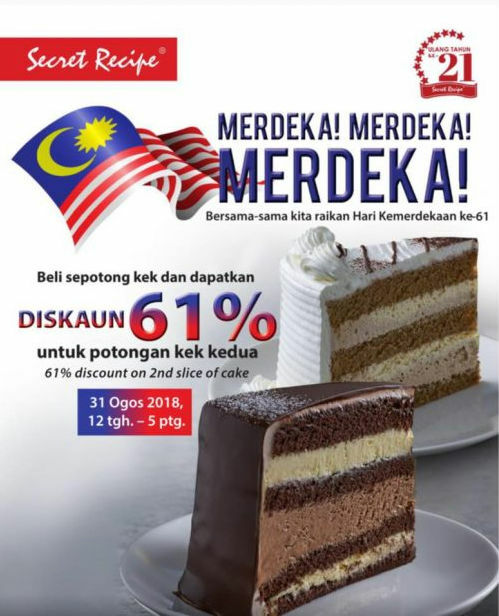 Malaysians just had a wonderful LONG Merdeka weekend of celebrating, eating and last minute shopping at the malls to avoid the SST (Sales and Service Tax) which kicked in on 1st September 2018. 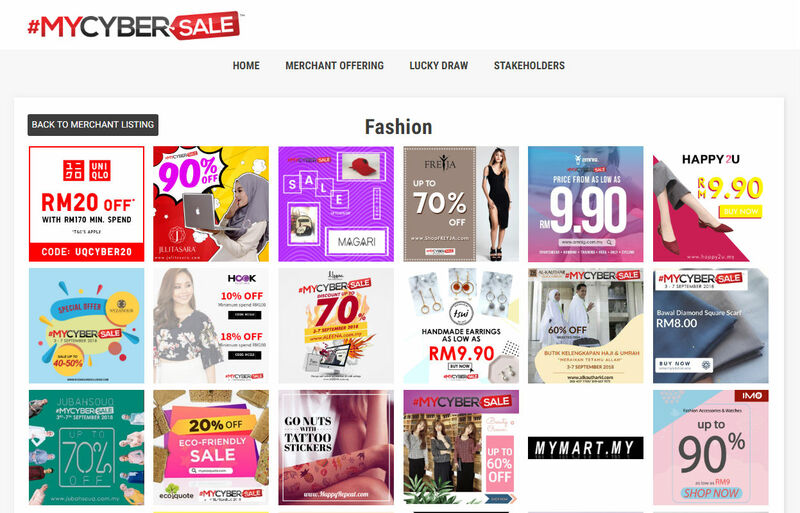 Now comes MyCyberSale 2018 which offers Malaysia’s BIGGEST online shopping sale event of the year where Malaysian online sites and marketplaces offer a tonne of discounts and promotions for 5 DAYS in a row which starts from 3rd – 7th September 2018. 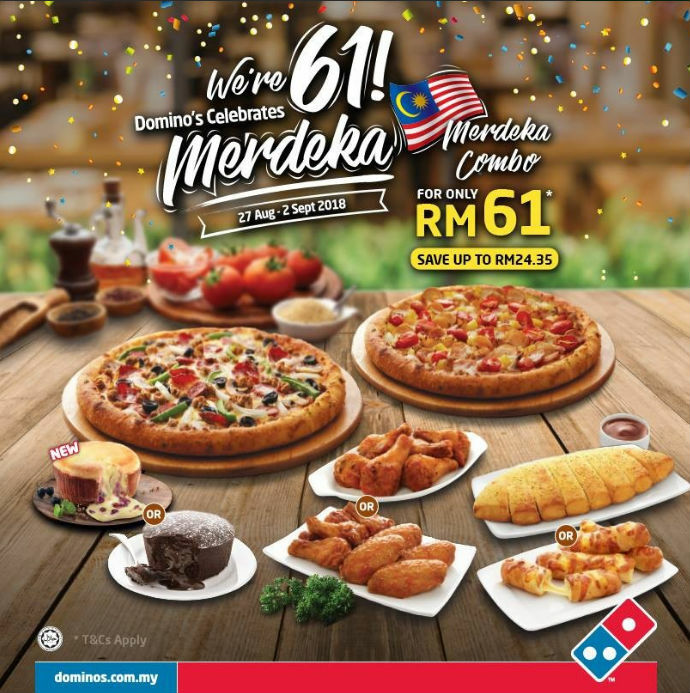 You could say the whole of Malaysia and entire South East Asia region will be shopping online this entire week! When Does MyCyberSale Take Place? 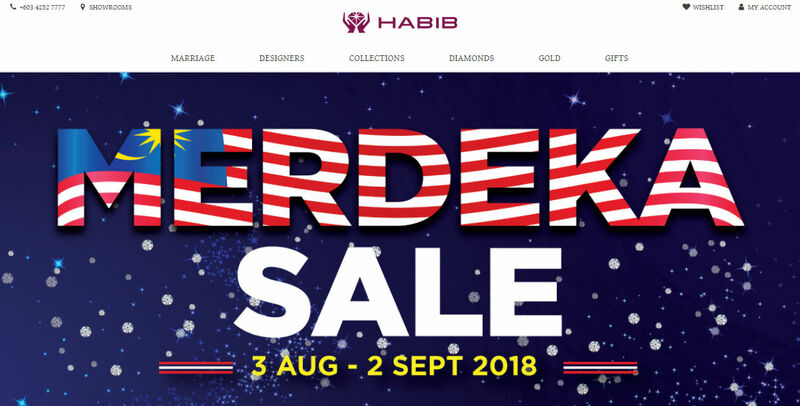 Malaysia’s MyCyberSale usually takes place between our National Day (31st August) and Malaysia Day (16th September) annually. 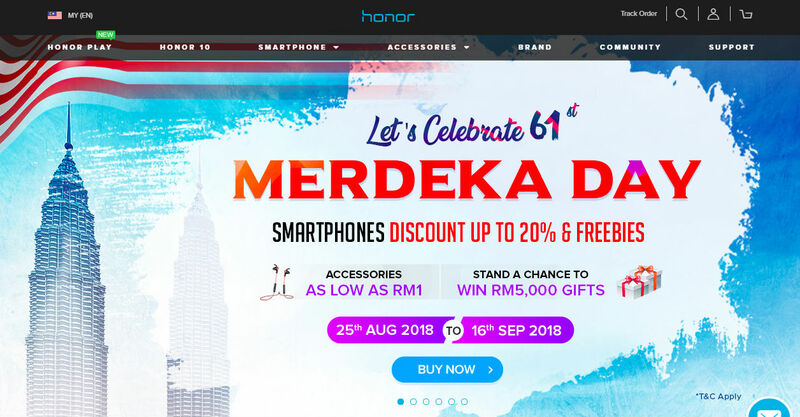 You could call it Malaysia’s annual version of China’s Singles’ Day or the States’ Thanksgiving + Black Friday and Cyber Monday event. All the shopping happens online. Although the volume doesn’t come close to China or the States, but hey, at least we get our own online shopping sale event to shop our hearts out. Let’s face it. 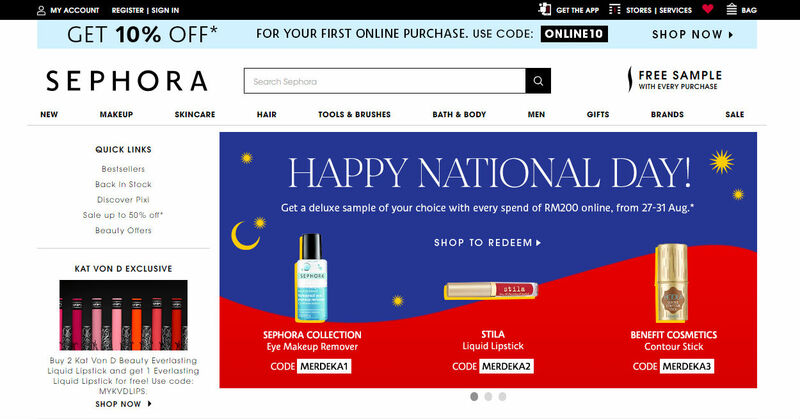 Other than FOOD, Malaysians’ next favourite past time or hobby is SHOPPING ONLINE. 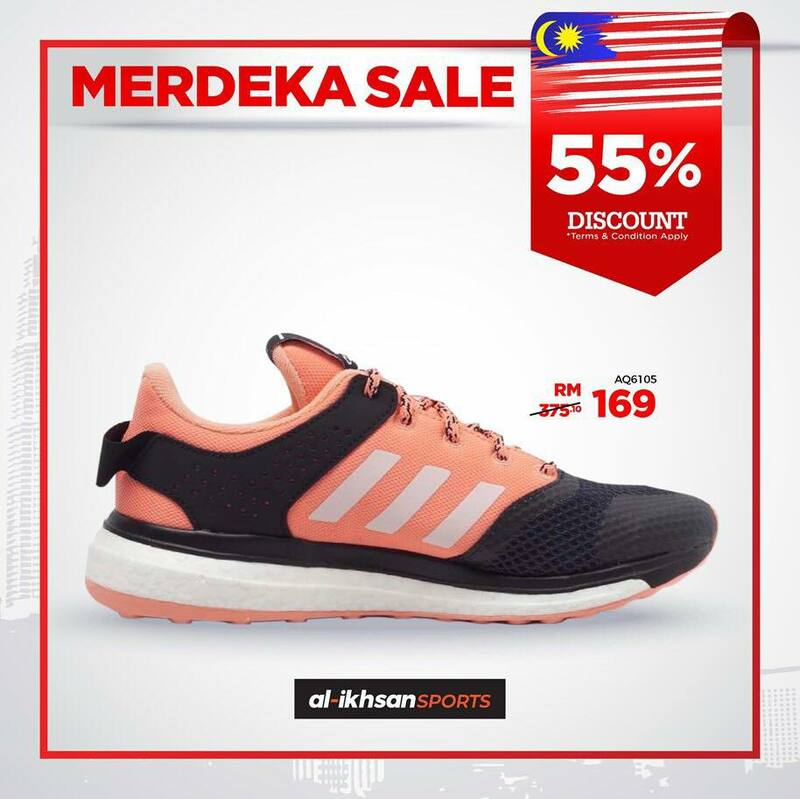 We love online deals, promotions and offers where one can get any product or service on sale at a discounted price. 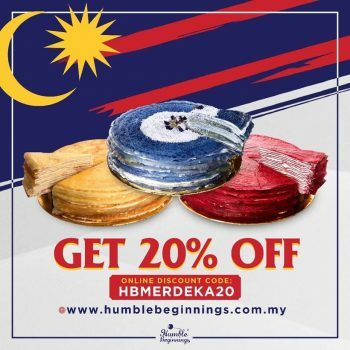 It’s also an excellent way to encourage our local Malaysian ecommerce pool of merchants and online businesses to offer amazing discounts and promotions during this online sale period to spur the local economy. 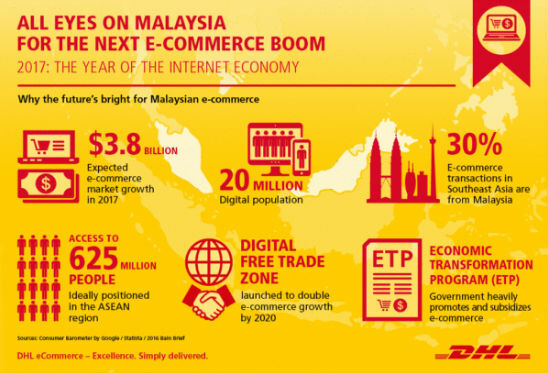 Did you know that Malaysia is one of the FASTEST growing emerging ecommerce market in the region? So Where Can I Find MyCyberSale 2018 Offers And Promotions? 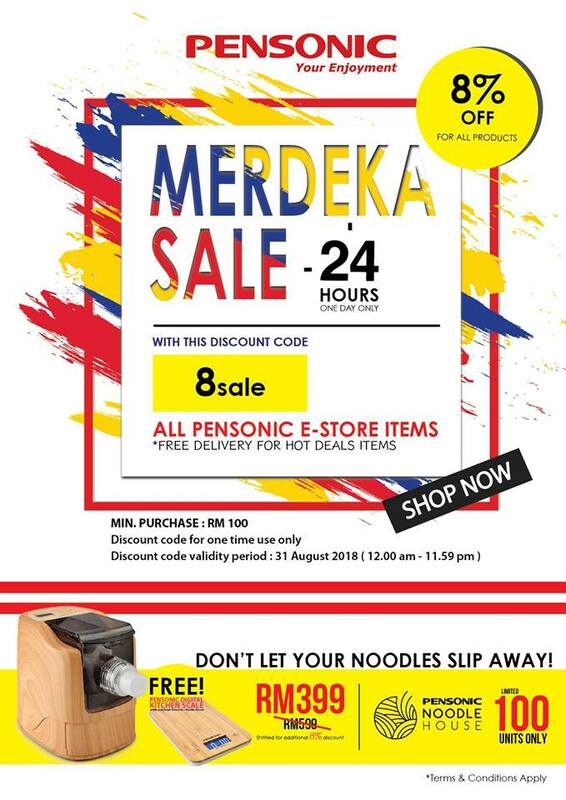 MyCyberSale is an ecommerce initiative by MDEC (Malaysia Digital Economy Corporation) in collaboration with PIKOM (The National ICT Association of Malaysia). ICT stands for Information and Communication Technology. There’s 21 different categories with a total of 876 merchants offering discounts, promotions and free shipping the MyCyberSale.my site. You’ll notice that the largest number of offers fall within 3 categories which are Fashion, Health & Beauty and Baby & Kids. It can get a bit overwhelming with all the blinking ads all eyeing for your attention. Decide what you NEED for yourself. Determine which category and what type of product you’re looking for and make the necessary comparison. Otherwise, you’ll end up wanting to buy EVERYTHING since there’s a whole bunch of offers going on right now. Oh, and if you’re buying anything that’s RM50 and above from the listed merchants, you’ll be eligible to participate in the Lucky Draw. Tell Me, What Do Folks Normally Buy During MyCyberSale? Our wonderful neighbour down south Singapore would be having a blast buying from Malaysia as their strong Singapore Dollar allows them to get a better bang for their buck here. Shoppers use both desktop and mobile to complete their online purchases. 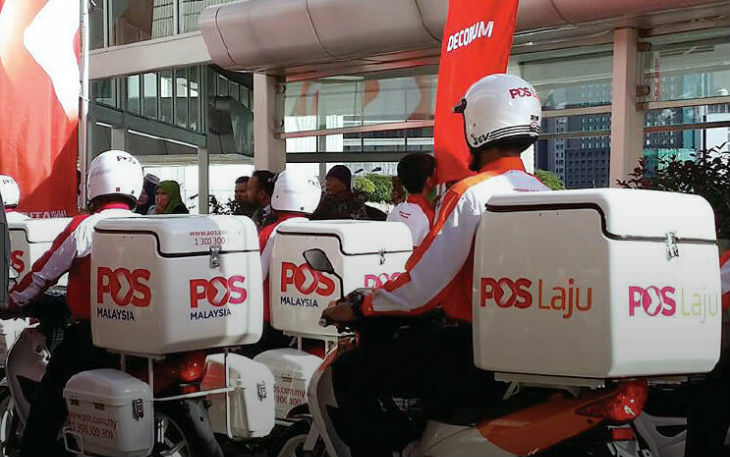 The bulk of orders are shipped by our national courier service PosLaju allowing Malaysians to receive their online purchases within the next business day (if they don’t get too overwhelmed with the amount of orders!). Most of our Malaysian online sites accept online banking (FPX) and credit / debit card as payment method so shopping online is a breeze. 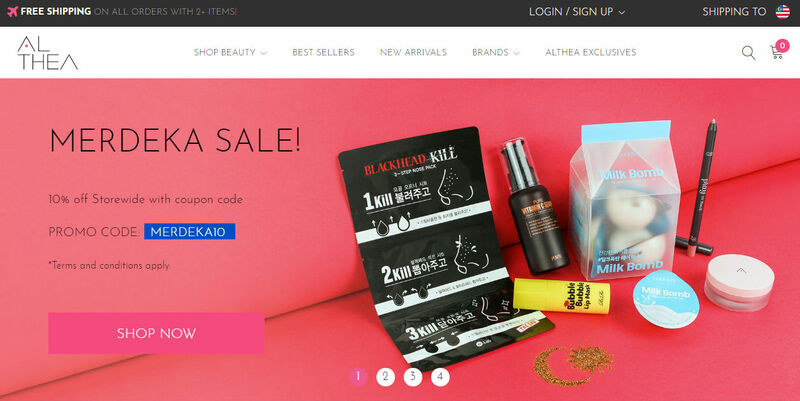 Is This The LAST Online Shopping Sale Event For 2018? Of course not! There’s always a reason to have online sales as Malaysians and everyone in this region enjoy shopping online. 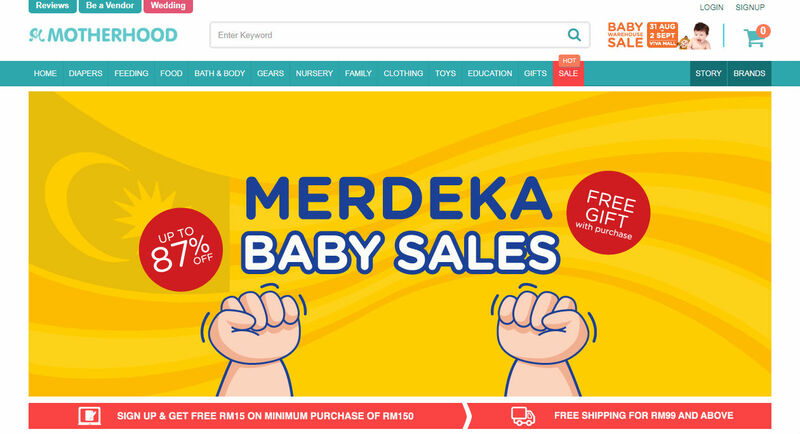 If you miss getting something that you want during MyCyberSale 2018, there’s the upcoming 9 September 2018 ONE DAY SUPER SALE by the online marketplaces being offered by Lazada, 11Street, Shopee, etc. 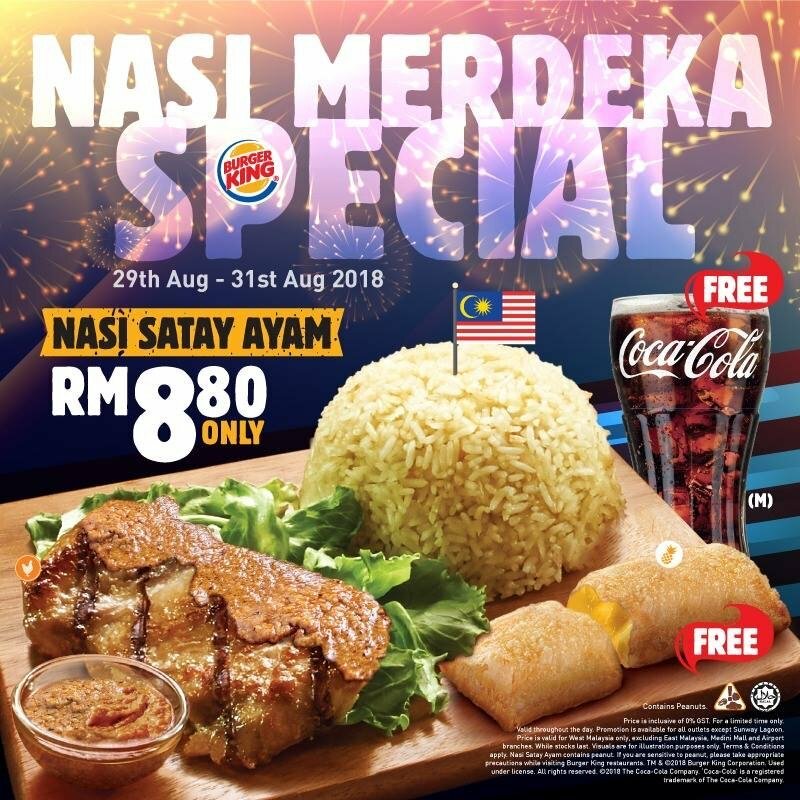 For your info, 9th September 2018 is Malaysia’s King’s Birthday which falls on a Sunday making Monday 10th September 2018 a public holiday. And to top it off, 11th September is Awal Muharram which is a Muslim religious holiday. So Malaysians have an even longer weekend holiday coming up this week. We’ll probably need to rest and chill with the amount of online shopping we’re doing from last week spilling to this week! So have a wonderful time shopping online this whole week folks. The MacBook Air is going to get a successor soon, this according to Bloomberg. Besides having a slimmer price tag and streamlined bezels, the newest Apple incarnation will have a high-res Retina display. The Air’s take two has been a long time coming because Apple has been giving its love and time to its pricier models, specifically the 12 inch MacBook and the MacBook Pro. Air has been considered a sort of educator/poor-man’s model, worth leaving on the bottom shelf for those on straitened means, but not necessarily worth updating. It could be that Apple is recognizing that the Air and other less prestigious models have loyal followers that should be thrown the occasional bone. To that end, Apple has further plans to upgrade the also long-languished Mac Mini, miniature desktop model. New processing and storage upgrades will arrive with a heftier price tag. But, that’s because Apple realizes that Mini users have been multi-tasking on the Mini for some time now and deserve to be able to do so more efficiently. The new incarnation has been on the back-burner while Apple has been putting its energy into its 12 inch MacBook and MacBook Pro lines. Some have suggested that the far less expensive Air laptop was relegated to the bottom shelf by Apple as a model that attracted mainly educators and pinch-pennies. Mini Mac, Apple’s miniature desktop model has also been gathering dust and will be soon given an overhaul. Instagram is absolutely massive today. Facebook got an unbelievable deal when they bought Instagram for $1 billion back in 2012. Now, there are some accounts and people on Instagram that garner an absolute ransom for one singular post on their Instagram accounts. It is hard to tell which is the most valuable accounts but the power that some of these celebrities have is absolutely incredible. The soccer player from Portugal and Selena Gomez are two of the biggest. Instagram is a huge marketing tool for many companies in today’s culture. Jenner has an incredible reach of followers on her own Instagram and she can charge a lot. Celebrities have incredible power in the world of marketing and people try to get them to promote. 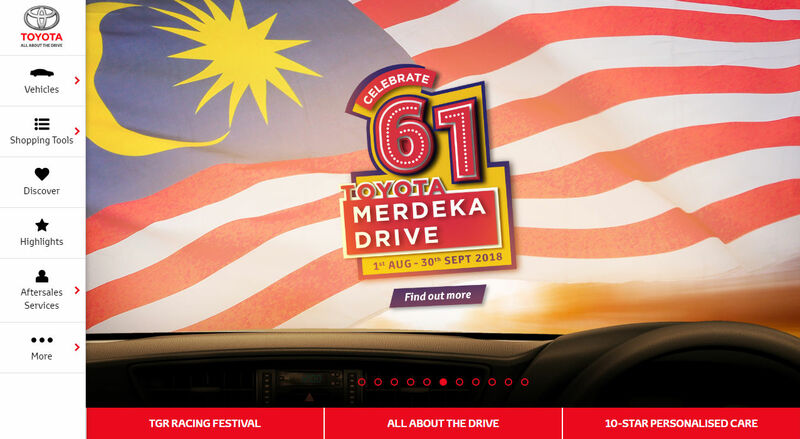 Malaysia will be celebrating its 61st Merdeka (Independence Day) this 31st August 2018. 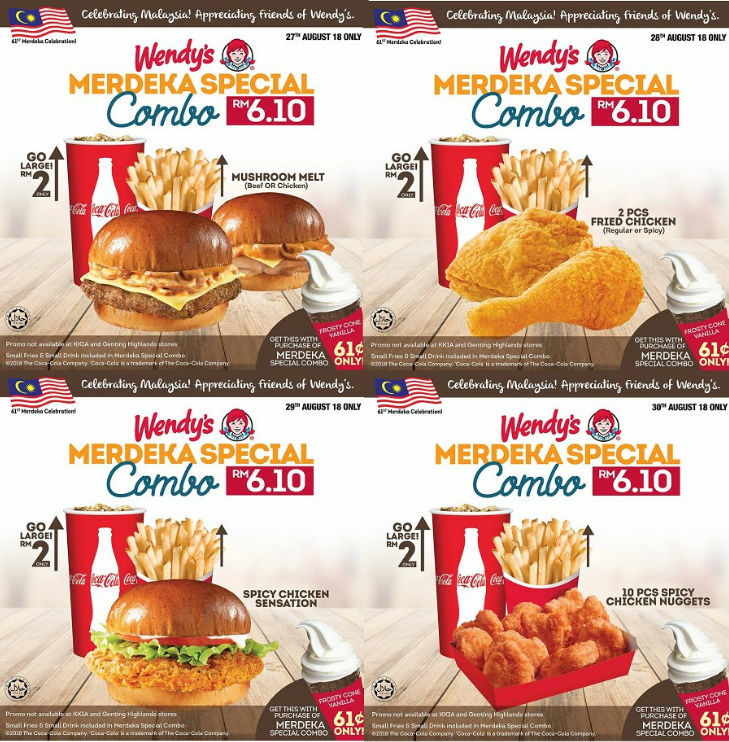 Since everyone’s looking forward to the long Merdeka weekend to chill, EAT and do some LAST MINUTE SHOPPING before we welcome the new SST (Sales and Service Tax), we’ve decided to compile a list of 50 Top Merdeka 2018 Promotions and Offers that you don’t want to miss out on. Malaysian love to eat. We’re multi-racial and everything we do seems to revolve around food one way or another. Forget the diet this weekend. 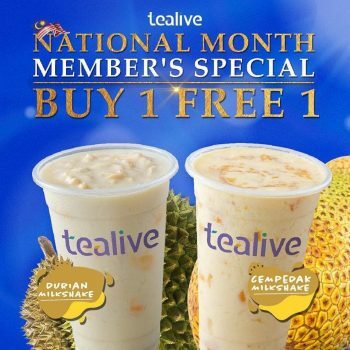 If you plan your time well and add in a bit of kiasu (can’t loose) attitude, you’ll have a great time enjoying these wonderful offers. We all need to eat right? 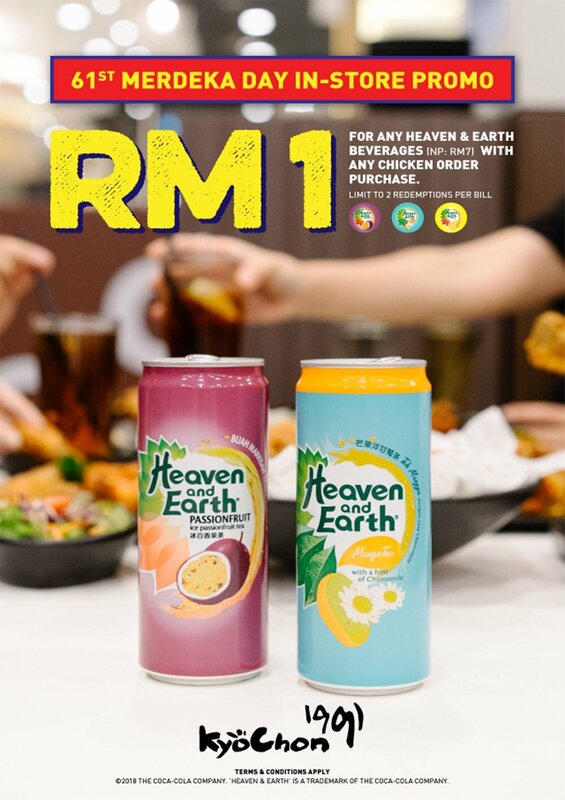 Drop by KyoChon 1991 stores to grab a Heaven and Earth tea for ONLY RM1 on this day! 2. 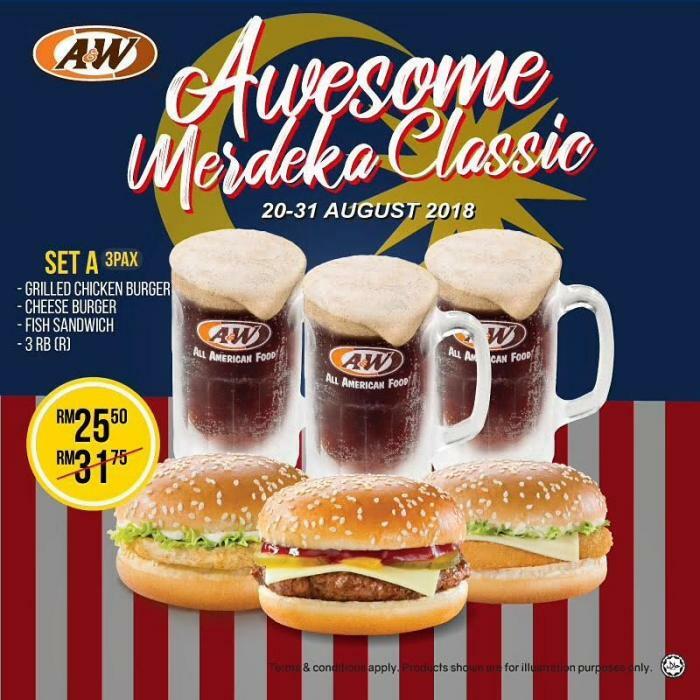 Only available on Merdeka Day (31st August 2018). 3. Only applicable with any chicken purchase. 4. Maximum 2 redemptions per bill. 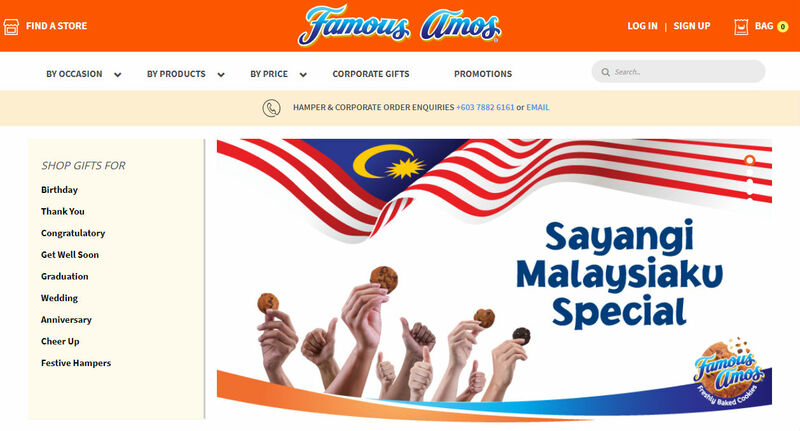 Famous Amos Malaysia is having their FREE 50% Cookies Giveaway. Enjoy 50% extra cookies if you purchase 300g in bag and many more. Free 50% cookies (150g cookies) with every purchase of 300g cookies in bag. 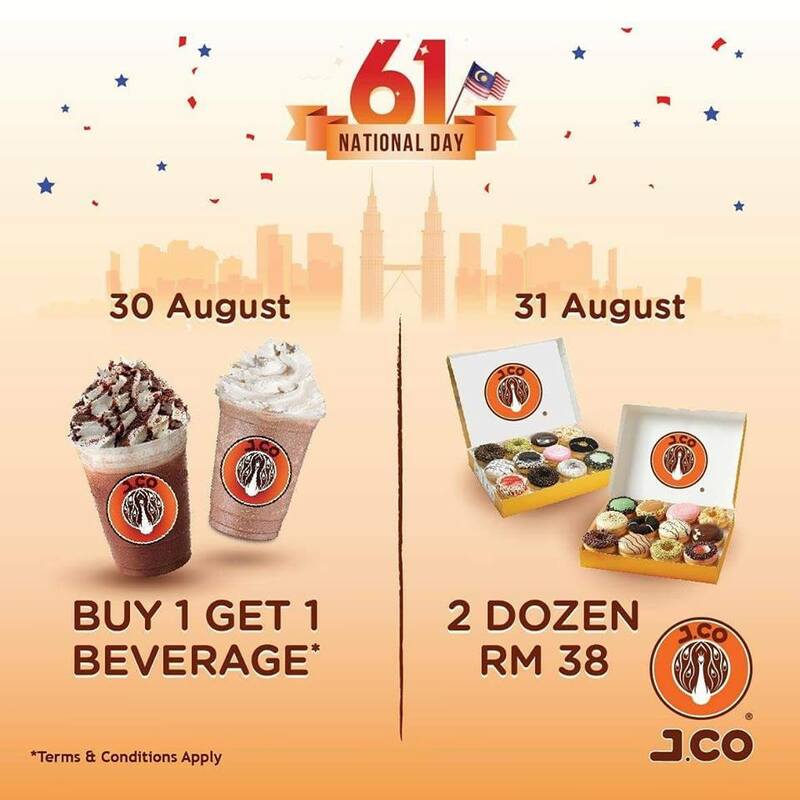 Not valid with other on-going promotions, offers and discounts. 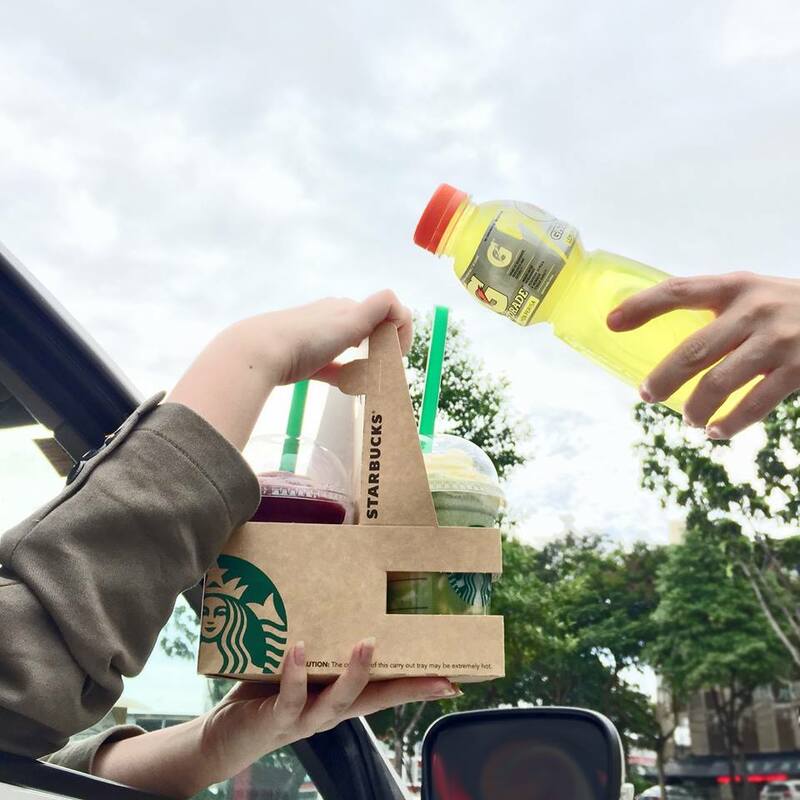 Get a complimentary bottle of Gatorade* with a minimum spend of RM30 in a single receipt! Valid at all Starbucks Drive-Thru stores, drive-thru window only. You can get this limited edition ice cream from today – 31st Aug at any Baskin-Robbins outlet. 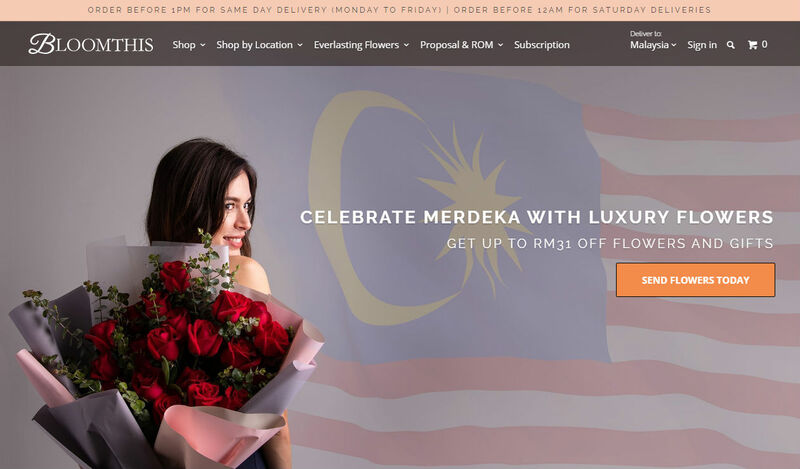 Other than eating, Malaysians love to shop online. Who can resist a good online deal especially when it comes with free shipping? 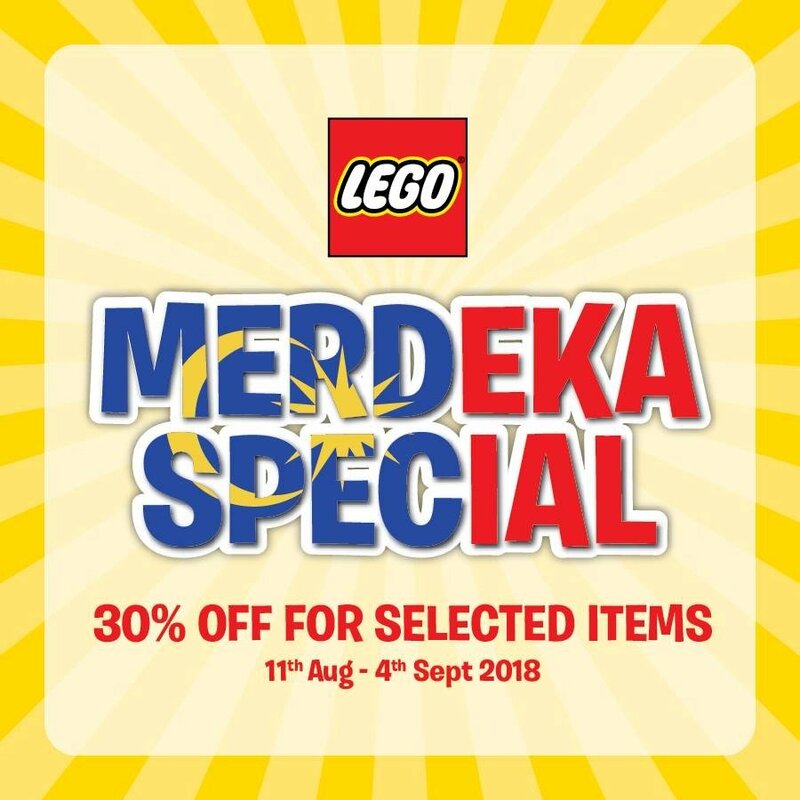 There’s plenty of Merdeka 2018 shoe offers going on. 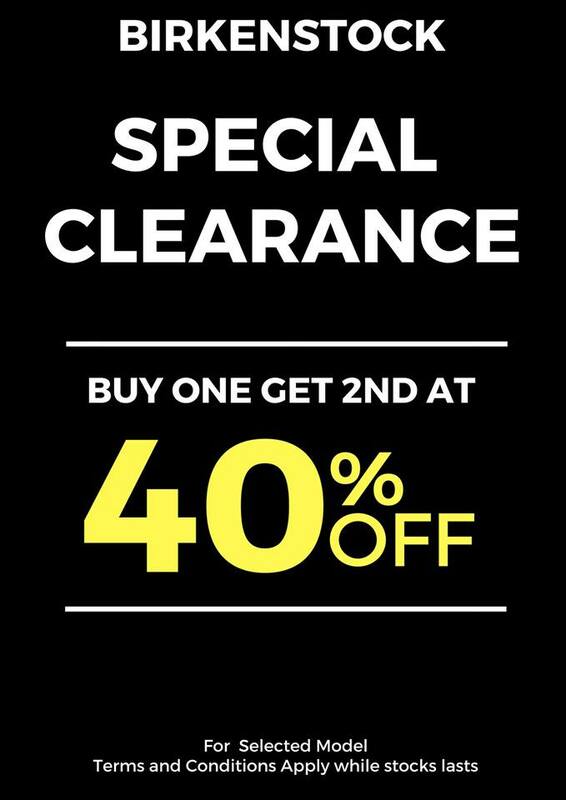 Enjoy discount 40% off every second pair of shoes purchase in one single receipt with minimum purchase of RM310 and above at normal retail price for Classic range and Professional range. *Not applicable for discounted items/ instant rebate promotion/ credit card promotion and others. *Terms & Conditions apply. While stock last. 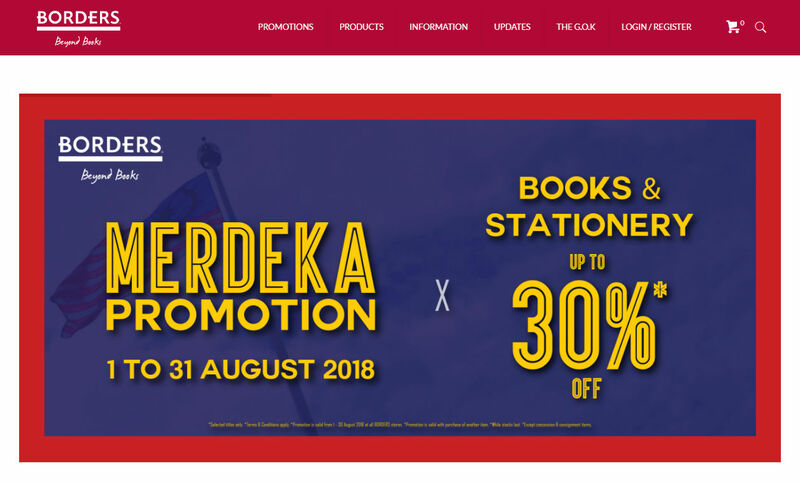 Merdeka 2018 book offer. Stationery are also on sale. Grab them now for the kids or yourself. These still time to get those home and living products for the house since we’re at the tail end of Malaysia’s tax holiday season. Better late than never. 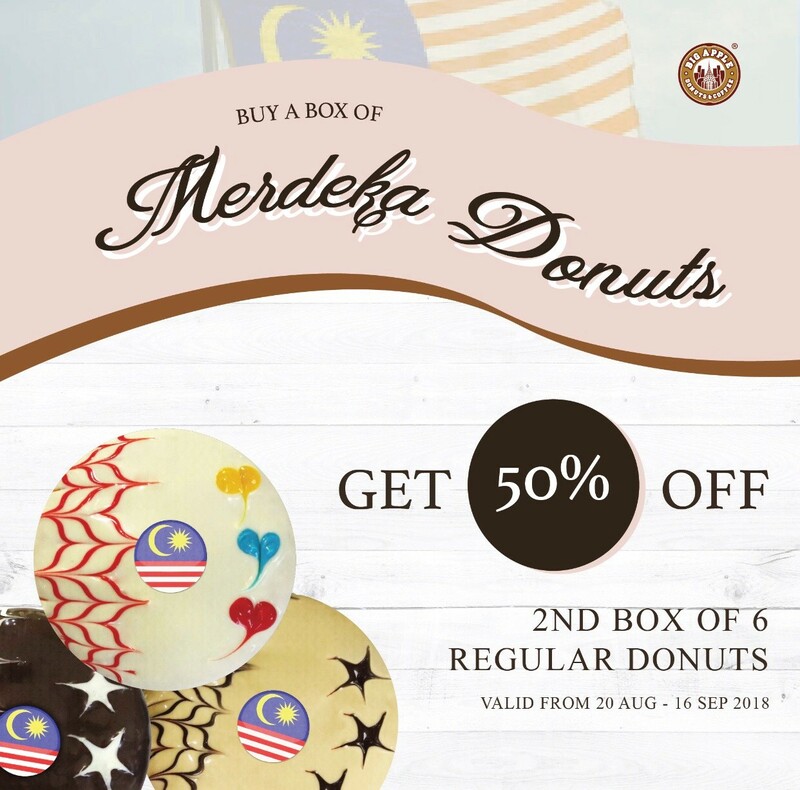 Get these Merdeka 2018 product offers now. 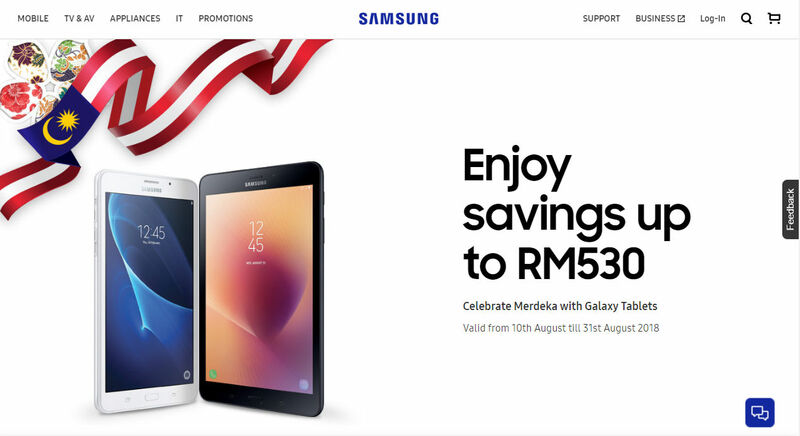 Quickly get your mobile, tablets, computers and tech gear by taking advantage of these Merdeka 2018 mobile offers before the coming SST! 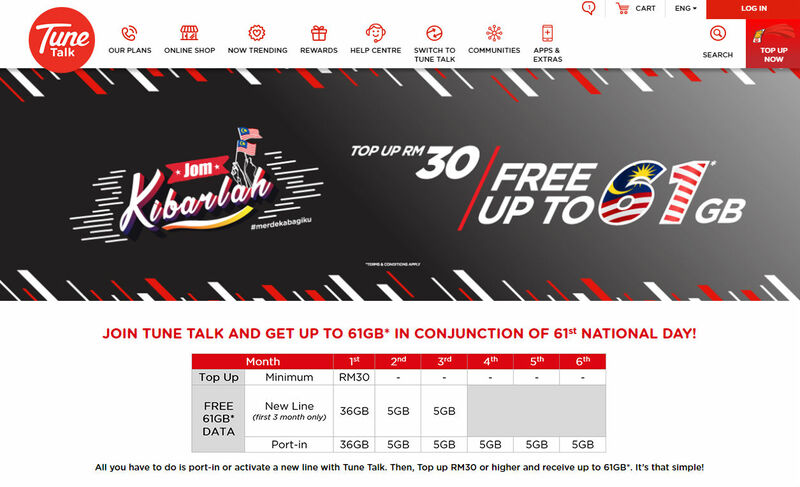 Both postpaid and prepaid users have much to take advantage of this Merdeka 2018 plans with these telecommunication providers. 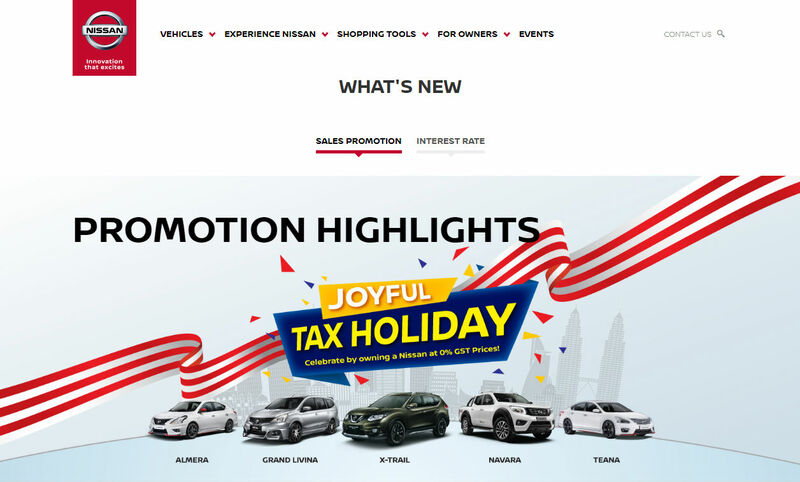 3 months of tax holiday from GST saw Malaysians car shopping like never before! What a wonderful season to get yourself a new vehicle before the upcoming SST. 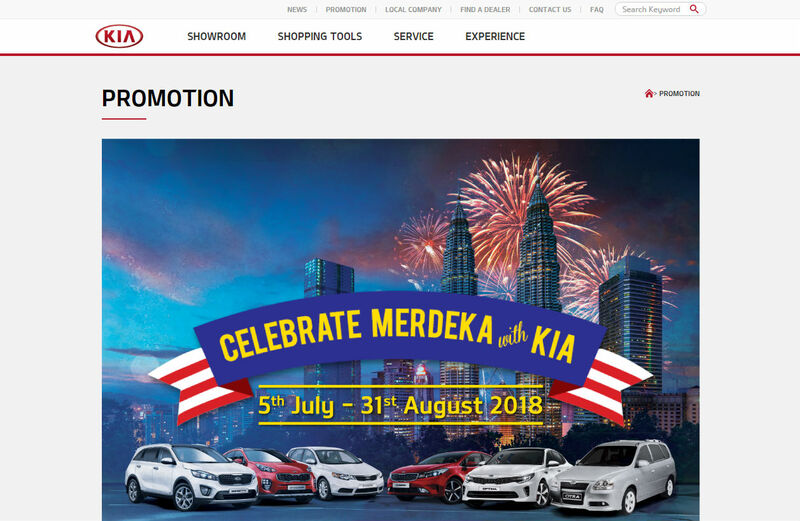 Check out these Merdeka 2018 car offers below. 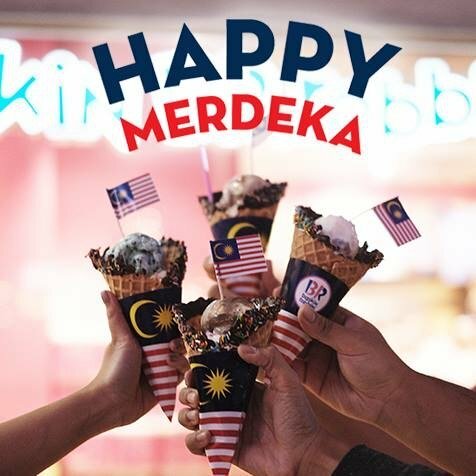 Well these 50 Merdeka 2018 promotions and offers should keep you busy on Merdeka Day itself if not the entire long weekend! 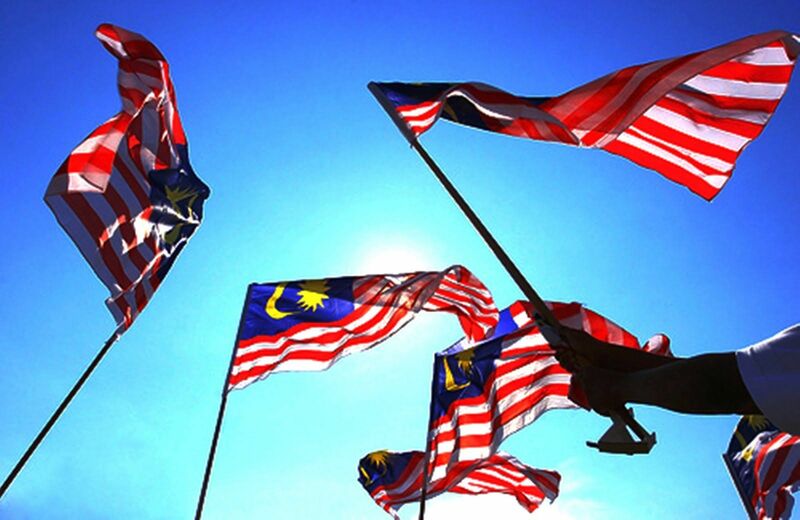 Wishing all Malaysians Happy Merdeka as our nation celebrates it’s 61st birthday! 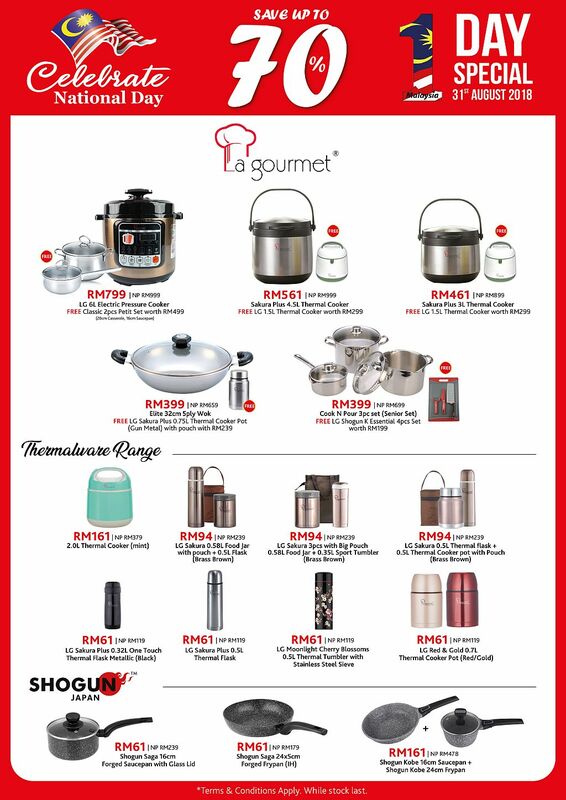 Enjoy the long weekend and have fun with all these wonderful offers and promotions. Payment gateways provide the service to process online payments from customers to merchants securely. When integrated with any ecommerce website, the role of payment gateways is to allow customers to pay for their online purchases using either credit or debit cards or via online banking smoothly. Here’s a look at some of the best Malaysia payment gateway providers used by the majority of Malaysian online sellers. 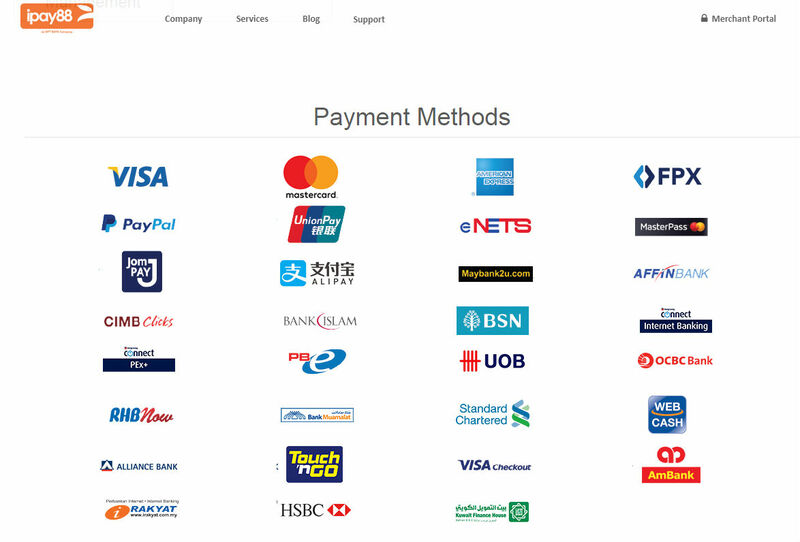 You’ll find the best Malaysia payment gateway comparison chart at the later part of this article. PayPal is well known internationally as it’s widely used by both local and international sellers. 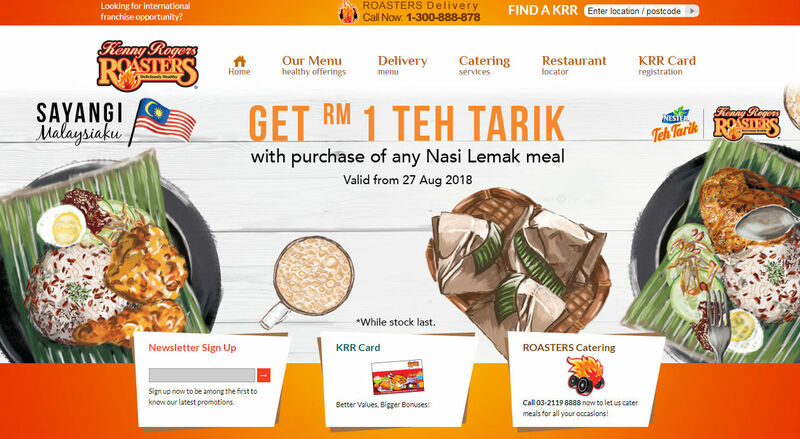 Customers DO NOT NEED to have a PayPal Malaysia account to make payment on a website that is using PayPal as their payment gateway processor. 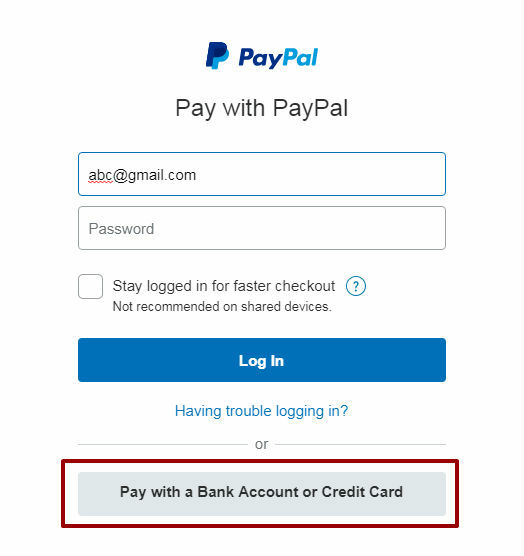 Customers can just use their credit or debit card when they land on PayPal’s site during the checkout process by clicking the “Pay with credit card” link. PayPal is a flexible payment gateway Malaysia that is both popular and easy to manage. 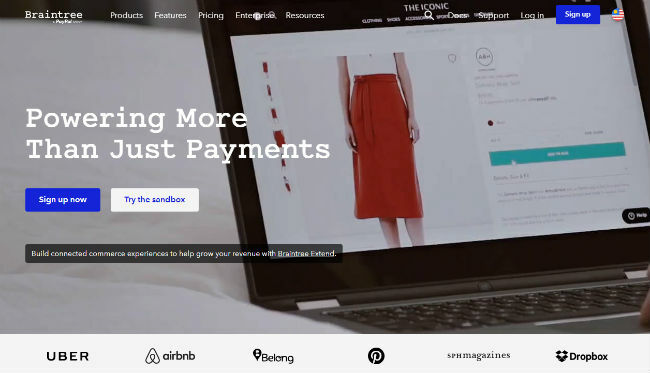 PayPal Malaysia does not require any sign up fee or yearly fee to use their online credit card processing Malaysia feature making it highly recommendable for new startups to begin accepting credit / debit card payments from customers. However, please note that while PayPal is easy to set up and use, their transaction fee is 3.9% + RM2 for credit / debit card online transactions for Malaysian customers whereas international customers buying from you will be charged at 4.4% + USD0.30 per transaction. However, setting up a PayPal Malaysia account to accept payment is easy and fast. Just go to PayPal Malaysia’s site and sign up for a business account. Key in your details and remember to link your PayPal account to your online store to start accepting online payments. 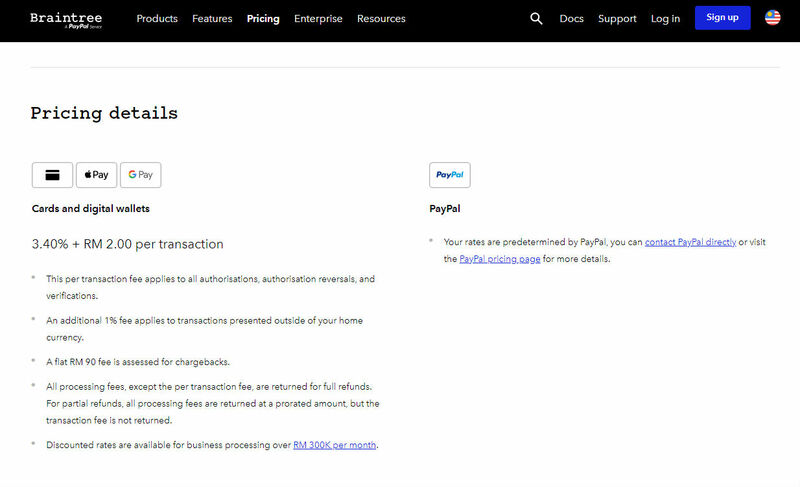 Here’s how to link your InstanteStore to PayPal. 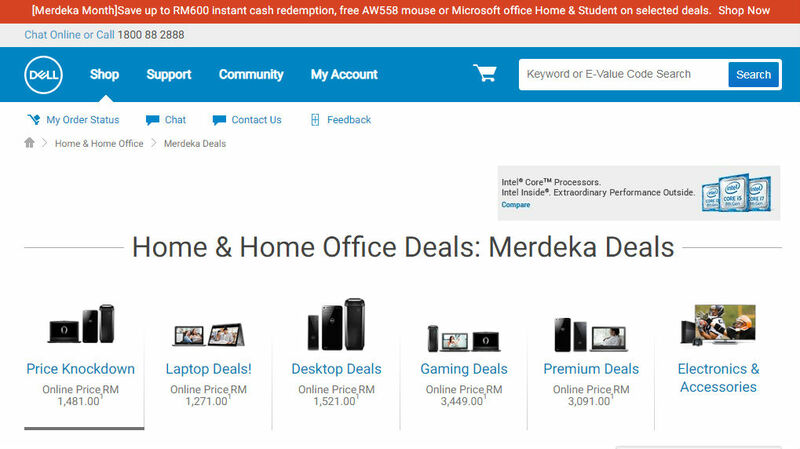 PayPal Malaysia does not offer FPX online banking. You’ll need to transfer the funds from your PayPal account to your local bank account. If the amount is less than RM400, there’s a RM3 charge by PayPal. There’s no charge if the amount is RM400 and above. Braintree is a payment gateway that was acquired by PayPal in 2013 with the goal of propelling the payment platform on a global scale. All kinds of businesses use Braintree to accept payments in mobile apps and websites as they have experience working with new business models. Merchants in Malaysia can accept PayPal, Apple Pay, Android Pay, and cards on the Visa and Mastercard networks as long as the cards are enabled for online use. Please note there’s a RM90 flat rate for chargebacks. Signing up for a Braintree Malaysia account may take a bit of time as the company requires your business registration details (Malaysian IC, Business Registration Forms, Utility Bills with business registered address, Malaysian Bank Account Statement that is registered with the business, etc) to verify that you’re a valid legal business before opening a Braintree account for you. The good thing about Braintree is that they offer a lower credit / debit card transaction fee (3.4% + RM2) compared to PayPal (3.9% + RM2) and that all payment is pushed to your local bank account on a daily basis. And like PayPal, Braintree does not charge any Setup Fee or Yearly Fee at all. 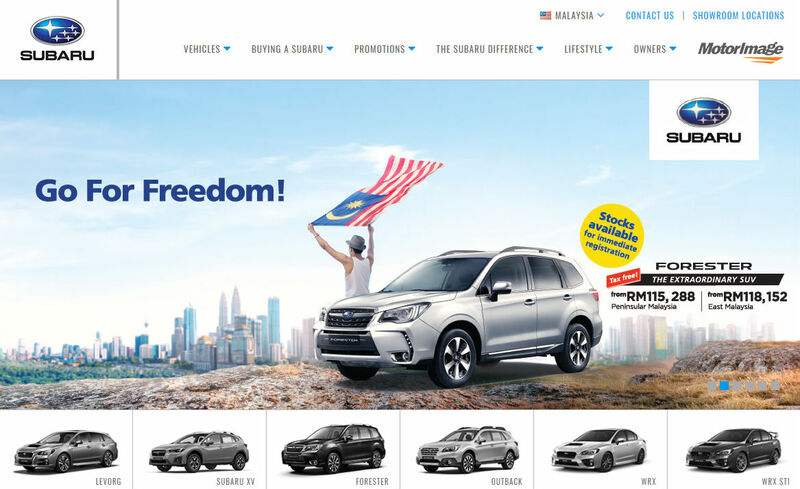 Braintree Malaysia does not offer FPX online banking. Braintree will automatically push all payment amount to your local bank account on a daily basis with no minimum amount. 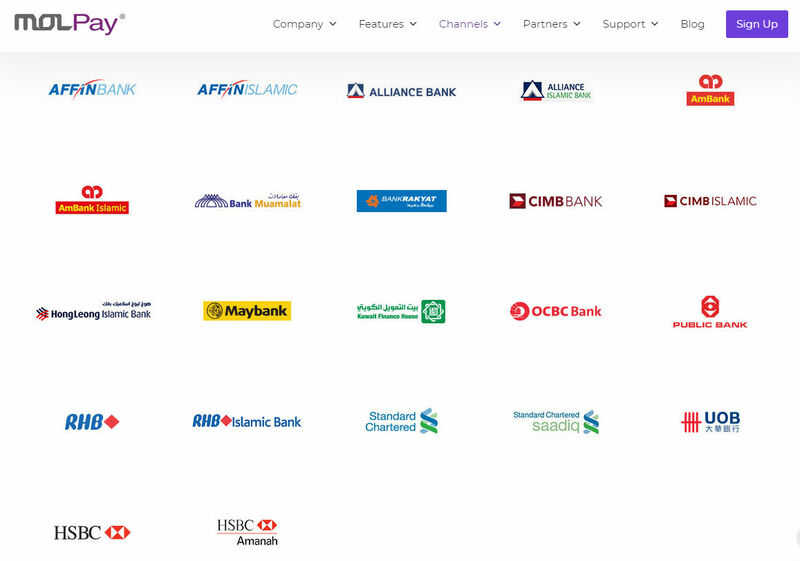 iPay88 is one of Malaysia’s leading payment gateway providers. 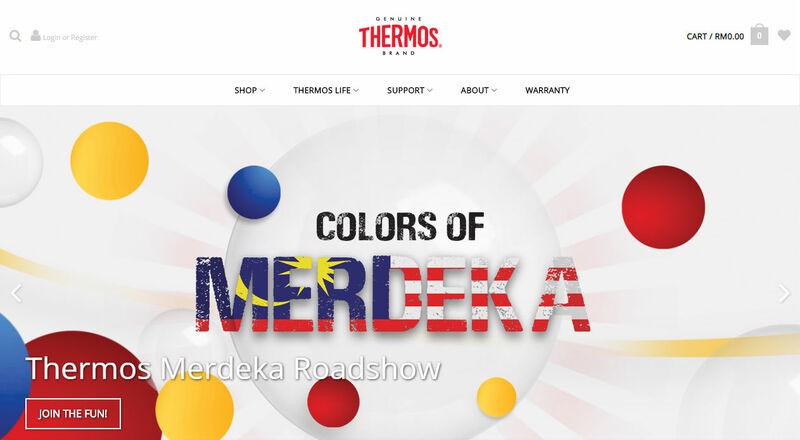 Their headquarters is located in Kuala Lumpur, Malaysia and they have a presence in Cambodia, Indonesia, the Philippines, Thailand and Singapore. 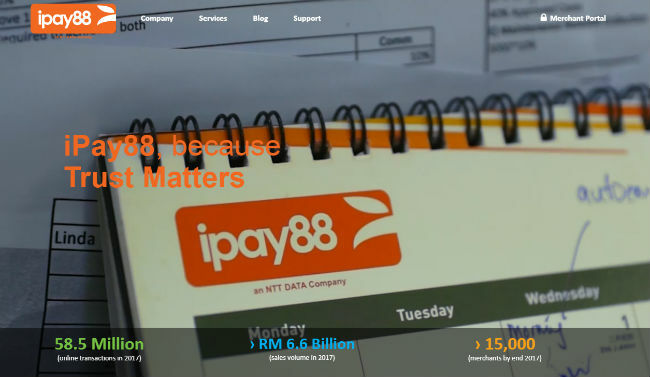 iPay88 was acquired by NTT DATA, a Japanese system integration company in 2015 and continues to strengthen their presence in the ecommerce and mobile commerce field in the whole of South East Asia. iPay88 Malaysia offers 3 different plans to meet your business needs. If you’re only looking for a payment gateway Malaysia FPX feature to accept payment via online banking from customers, then iPay88 comes highly recommended as their current SOHO Plan is FREE with NO SIGNUP FEES, NO YEARLY FEES. Bear in mind their FPX rate for the SOHO plan is 3.5% or RM0.60 per transaction whichever is higher. For credit / debit card processing with iPay88’s SOHO Plan, they’ll be using PayPal to process those payments at a lower transaction rate (3.2%) which is better than you using a direct PayPal account (3.9% + RM2 per transaction). The other 2 plans (SOHO + Credit Card Plan and SME Plan) will be using local Malaysian Banks to process credit / debit cards. These 2 plans come with a Setup Fee of RM488 along with Credit Card Application Fees of RM900 (waived by iPay88 for selected merchants). Their SOHO + Credit Card Plan offers credit card (3.2%), debit card (2.8%), UnionPay credit / debit card (3.2%) while FPX is at 3.2% or RM0.60 whichever higher. iPay88’s SME Plan comes with an Annual Fee of RM500 and offers credit card (2.7%), debit card (2.5%), UnionPay credit / debit card (2.7%) while FPX is at 2.7% or RM0.60 whichever higher. All plans include Boostpay (0% till end 2018) and Vcash (1.2%) e-wallet features. iPay88 will pay out on a weekly basis to your local bank account but the minimum amount is your iPay88 account must be RM10 for them to do so. 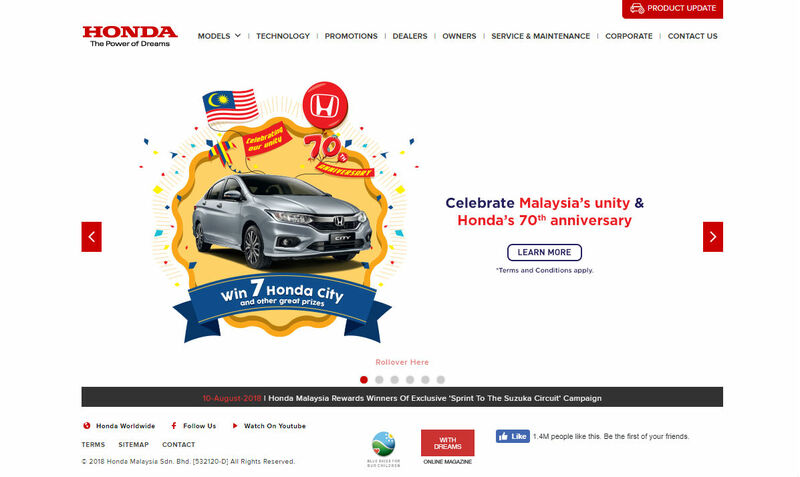 iPay88 Malaysia claims to have a proven fraud prevention system and monitoring in over 14 years which has resulted in fraud ratio far below the industry threshold. eGHL was founded in 2013 and functions as an internet payment arm of GHL Systems Berhad. You’ll notice quite a number of physical card payment terminals in physical stores and retail using GHL as their credit / debit card payment processor. So it comes as no surprise that the company entered the ecommerce payment gateway market with their internet payment arm, eGHL. 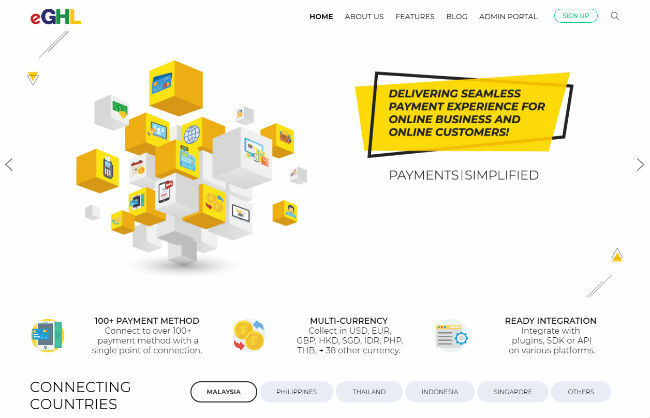 eGHL is a Malaysia payment gateway that offers a secure internet payment solution which covers both card and non-card payment channels for online businesses throughout the South East Asia region. eGHL offers a lower transaction fee for credit / debit card (2.5% – 2.8%) and FPX payments (2.5% – 2.8% or RM0.70 whichever is higher). Do take note that there’s a One Time Setup Fee of either RM399 or RM599 depending on the plan you pick. Coupled with that, there’s a Yearly Fee of RM399 (waived for first year) or RM599 (waived IF annual volume exceeds RM60,000). 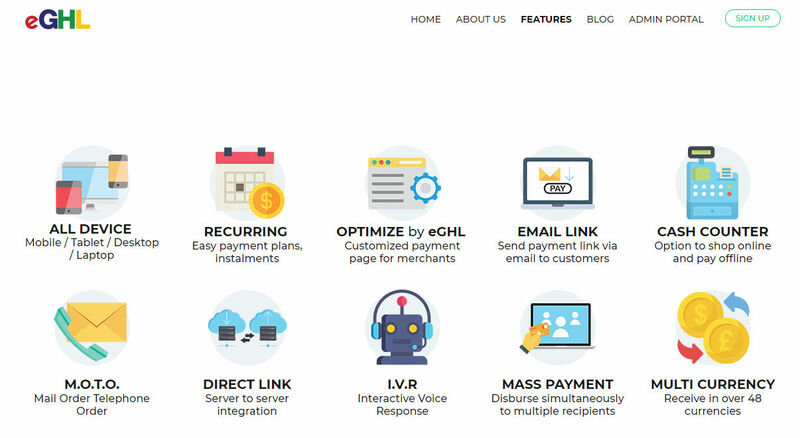 eGHL is an excellent payment gateway provider to consider if your business has consistent growing volume to justify the yearly fee while you enjoy lower transaction fee for credit / debit card and FPX payments. Payments are pushed to your local bank account on a weekly basis with no minimum amount requirement. 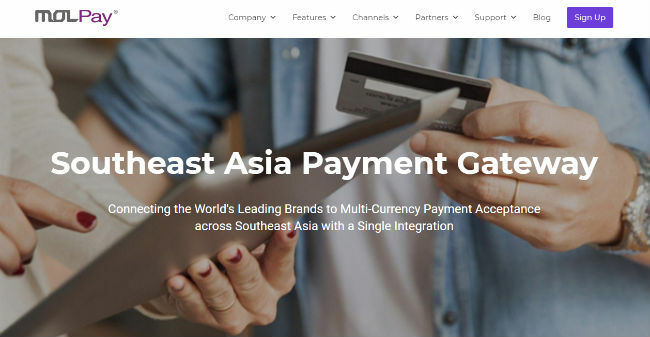 MOLPay is one of the leading payment gateway in South East Asia that has been connecting international brands to consumers across the region since 2005. 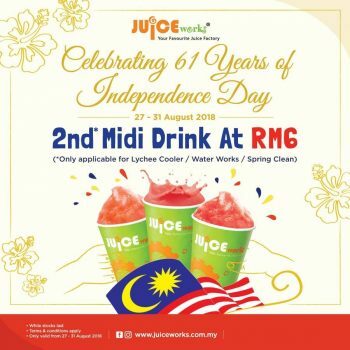 MOLPay Malaysia offers a full range of alternative payment methods such as online banking, cash at 7-Eleven (MOLPay Cash), e-wallet and more as their single API serves as a connector for clients to reach all consumers across South East Asia. 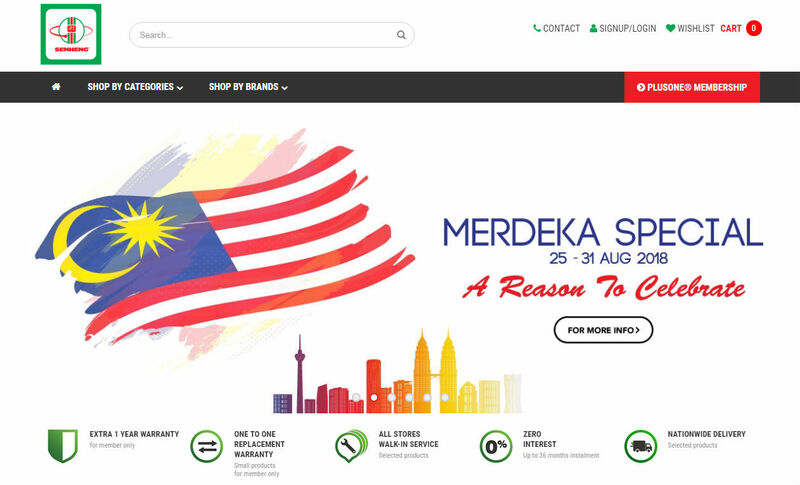 MOLPay Malaysia offers a Lite Plan and Premium Plan for ecommerce businesses. 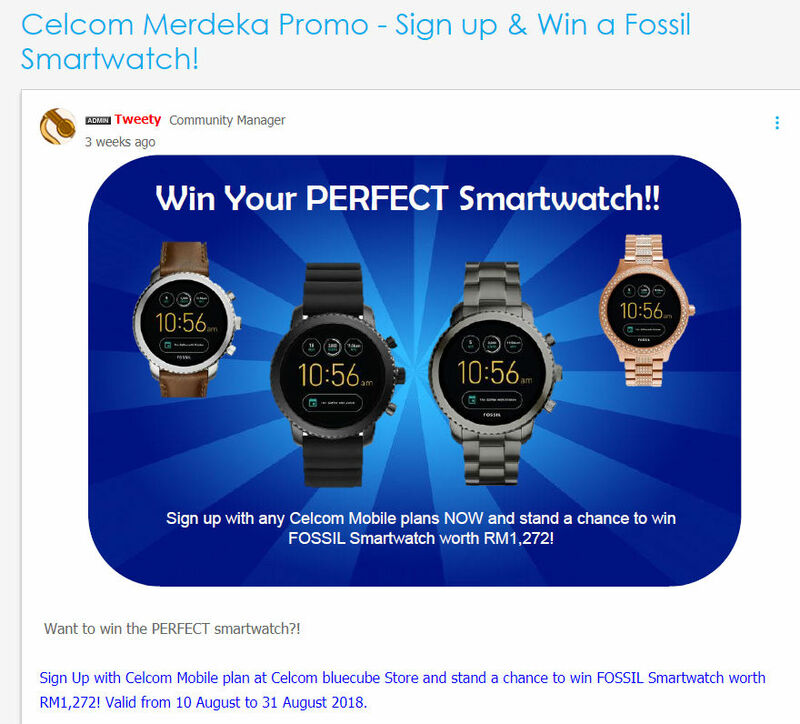 There’s a One Time Setup Fee of RM499 (Lite Plan) and RM400 (Premium Plan) and a Yearly Fee of RM99 (waived for 1st year – Lite Plan) and RM499 (Premium Plan). Also for Lite Plan, if previous year’s total payment processing volume is more than RM5000, the Yearly Fee will be waived. Serious sellers would go for their Premium Plan as it offers a lower transaction fee for credit / debit card (2.8%) and FPX (2.8% or RM0.60 whichever higher). To enable credit card processing, merchants need to pay a One Time Bank Processing Fee for credit card channel of RM900 (waived until 15th October 2018) for both plans. While they do pay out on a weekly basis, please note that there’s minimum payout amount of RM100 before they’ll process the payout to your local bank account. 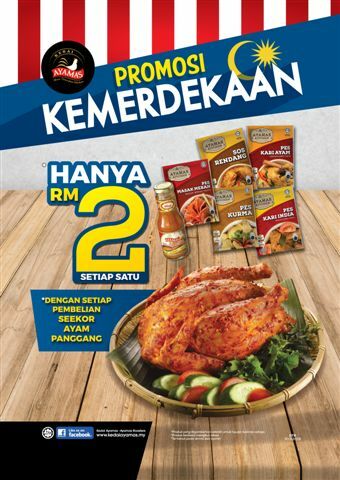 There’s also a RM2 Settlement Fee if you go with their Lite Plan which also have a minimum payout amount of RM100. MOLPay claims to achieve one of the lowest dispute transaction ratio in the online payment industry. 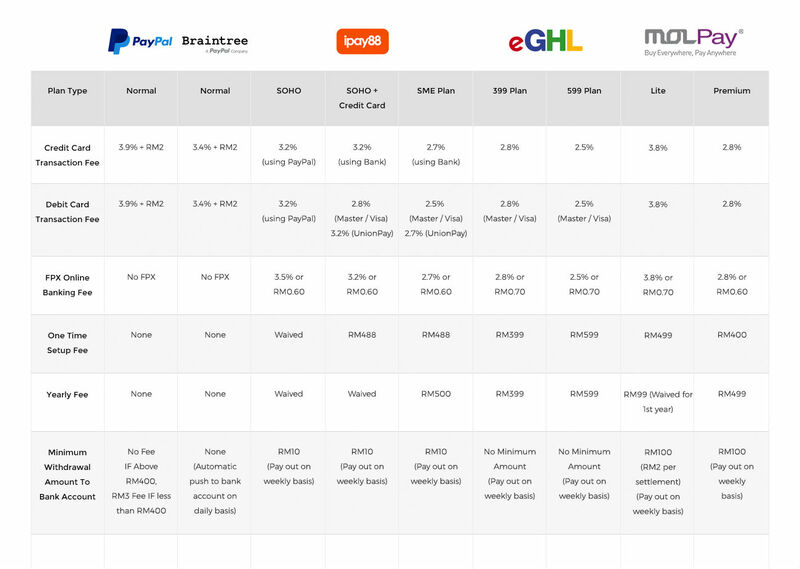 The Best Malaysia Payment Gateway Comparison Chart gives an overview of the payment gateway Malaysia fees for credit / debit card and FPX online banking, set up fees, yearly fees and minimum withdrawal amount to local bank account giving new and existing merchants the choice to sign up or switch to different providers. Merchants who are interested to enjoy the transaction rates mentioned can contact us and we will help them register for a new account with the respective Malaysia payment gateways. For startups and new businesses who are very budget conscious, we would normally recommend that they sign up with a PayPal direct account first while pending their application for any of the payment gateway providers of their choice. Most like the word ‘FREE’ so they’ll usually go for iPay88’s SOHO Plan where they do not need to pay any set up or yearly fee while enjoying access to both credit / debit card processing by iPay88’s PayPal and FPX Online Banking. For ecommerce businesses that have a considerable amount of daily, weekly and monthly volume transactions, they would usually go for eGHL as they offer one of the lowest credit / debit card and FPX transaction fees. The other option would be MOLPay where those businesses have both an ecommerce and physical presence as MOLPay offers a range of payment processing features across different channels. Which Payment Gateway Options In Malaysia Should I Choose? 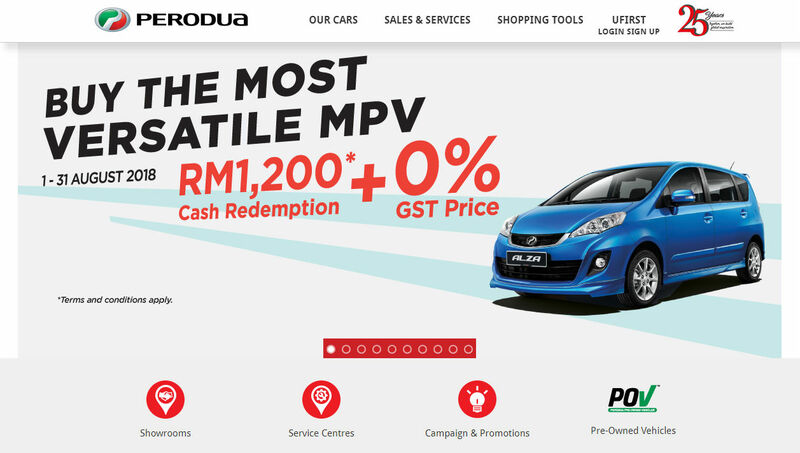 The best Malaysia payment gateway provider really depends on the merchants’ business needs. If you want something fast and ‘free’ without the hassle of paying setup fees and yearly fees, PayPal Malaysia, Braintree Malaysia and iPay88’s SOHO Plan are suitable. If you have a tonne of transactions to process for both online and physical retail, then eGHL and MOLPay will be able to meet those needs. 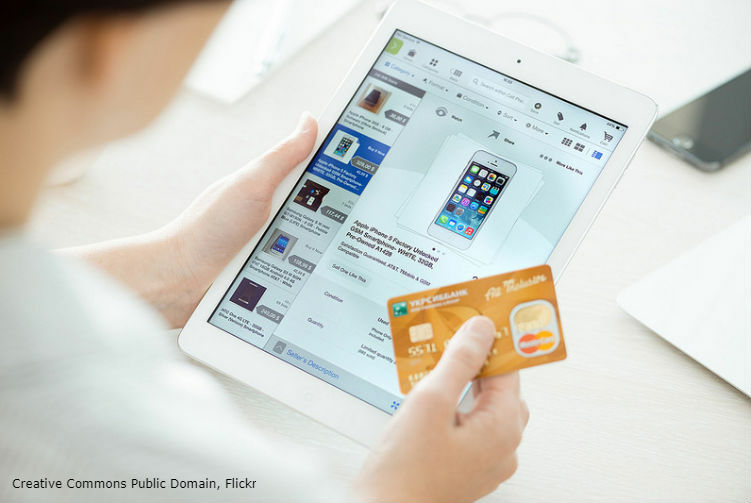 Regardless of volume transactions, it’s vital that any ecommerce business must have an online credit card processing Malaysia feature on their site as majority of buyers prefer to pay with credit / debit cards. 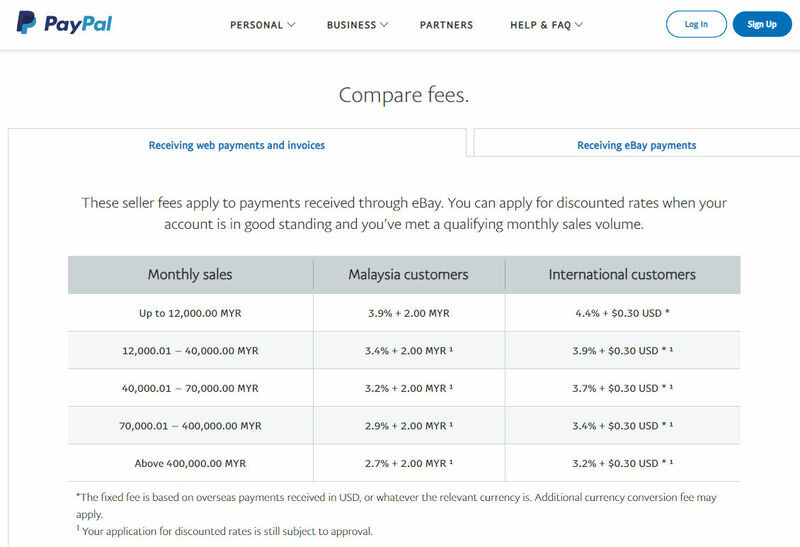 This payment gateway Malaysia comparison chart acts as a guide for new and existing sellers to consider which Malaysia payment gateways can best meet their business needs. If you have any question or feedback about the mentioned payment gateways, please reach out to us at InstanteStore as we’re constantly working to help businesses sell more online. To get more clicks on your content, you must be diligent and very smart in how you promote. There is a lot of opportunity in today’s market to get people to view your content. However, it is difficult to draw the line between click bait and actual relevant content. Too many people that are streaming videos, or posts, use ridiculous headlines or photos to get viewers to think they are viewing something completely different than what they are actually showing. Having people visit your content is just the first step in the battle to gain followers. You have to be smart but more importantly, you need relevant information. Marketing is not as straight up as it used to be anymore because people are getting smarter.